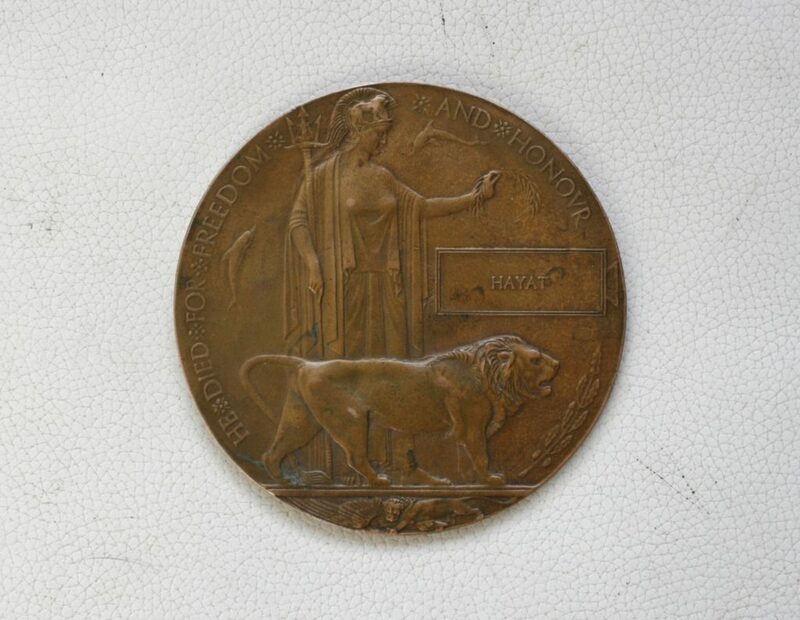 Those of you who’ve followed this site for a few years now might know that, although I’m not really a collector as such, I do have some battlefield relics I’ve picked up over the years on my travels, and I do splash out on the occasional Memorial Plaque, or Death Penny if you prefer, such as the one pictured above that came into my possession only today. I broke a golden rule in buying it, in that I have never, up to now, bought one that is not unique. How many John Smiths are there? There is nothing else on a Death Penny, other than a name, to distinguish one from the next. That way lies madness. And bankruptcy. And for me, the whole point of owning these evocative items is the direct link with a specific soldier who gave his life for me, for us, however indirectly. Nonetheless, I knew that Hayat could not possibly be unique, but I don’t own an Indian Penny, and the price wasn’t excessive, so I bought it. On returning home, after some very quick research and a lot of imagination, how’s this for a theory? 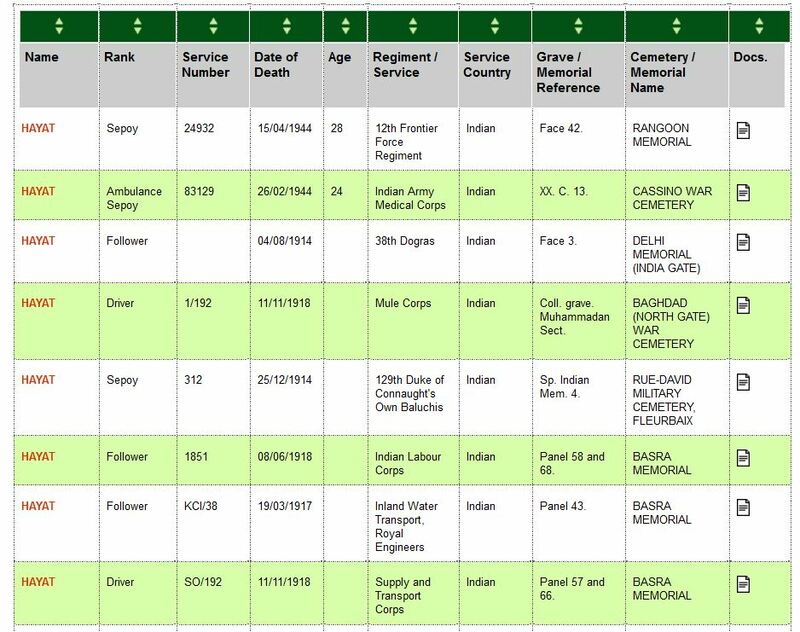 This is the page from the CWGC website with all the Hayats listed; the first two are discounted as they are Second World War burials. Three men are on the Basra Memorial and one is in Baghdad (North Gate) War Cemetery, all in present-day Iraq, and one is named on the Delhi Memorial. All a long way away. 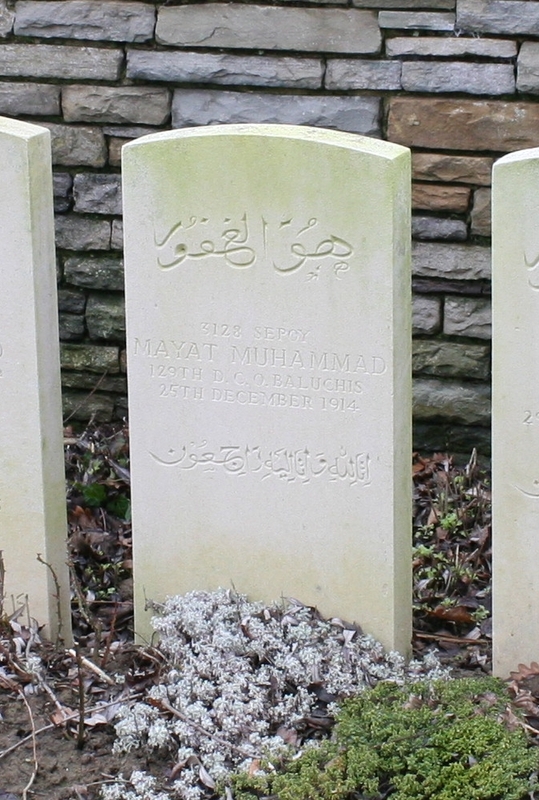 The other, Sepoy Hayat, of the 129th Duke of Connaught’s Own Baluchis, is the only one who died in France, on Christmas Day 1914, and guess where he’s buried? Rue-David Military Cemetery, Fleurbaix. And where were we just last post? 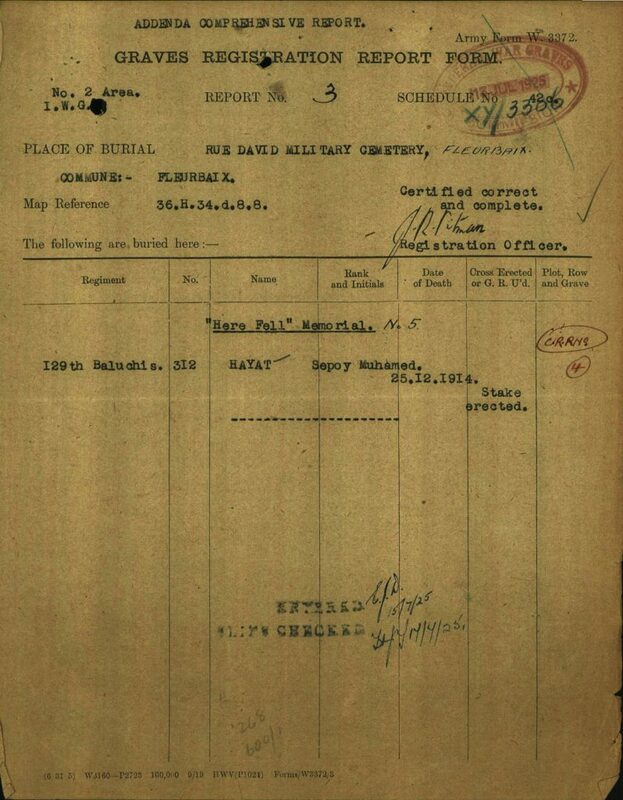 …as does the Cemetery Register, which, interestingly, for our purposes, names him simply as Sepoy Hayat. …and here is headstone number four in close-up, where we find that Hayat has become Mayat, and for this there is no explanation other than error. I wonder whether, at some point, his headstone has been replaced – it looks in fine condition – and the error occured then? His service number has also now become 3128 (as opposed to 312 on both the Graves Registration Report and Cemetery Register), and by the time of a third document from the CWGC website (see below), dated 1928, an eight has indeed been added, making the prime suspect a transcription error (also note that Muhamed has now become Muhammad). Quite probably this is all just fable, nothing more. You could shoot it down like a blazing Zeppelin if it was presented as any sort of serious thesis. 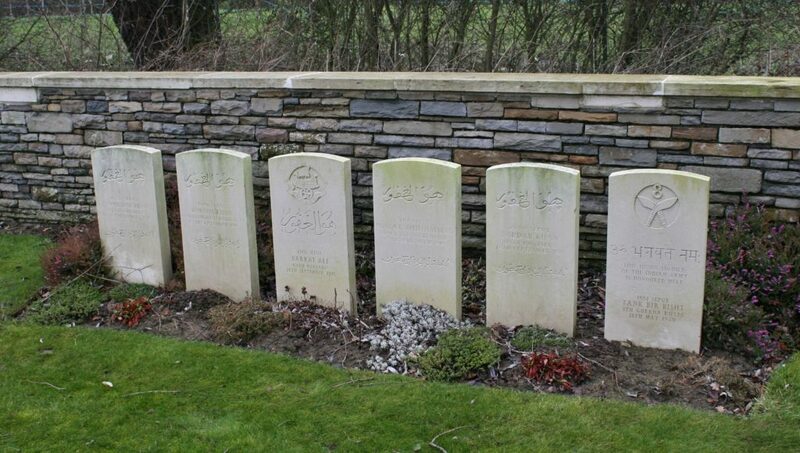 And although I have shown you the CWGC website page with all the Hayats, there are fifty five Hayat Muhammads or similar. But I rather like the idea that some hidden hand guided me to this particular Hayat’s Memorial Plaque today – there was another Indian one that I could have chosen instead – and however much imagination may have been used in my story, you can’t dismiss the Rue-David Military Cemetery coincidence. Well you can, but it makes it no less of a coincidence. 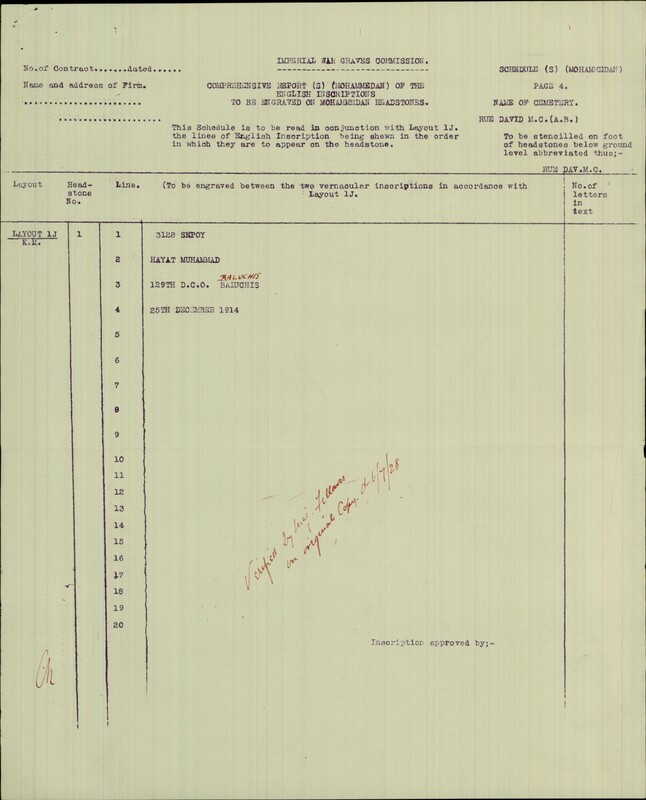 This entry was posted in French Flanders, Memorabilia. Bookmark the permalink. Magicfingers sleuthing is unsurpassed; I constantly add to my knowledge through your posts making it worthy that I salute you. His Service Number 312 caught my eye in that decades ago it was our family home telephone number – back in the days when one turned a handle to ring a bell then speak with a telephone exchange lass in order to be connected to another telephone. Your post encouraged me into some minor sleuthing of my own and in a way it opens up a hornet’s nest of potential questions. For example, I now know Sepoy (sepoy) derives from the Persian word sipahi, which means soldier. All right, I’ll publicly admit I didn’t first read the column heading “Rank” and at first thought Sepoy (with capital ‘S’) was a Christian name. I’ll wager there’s a story behind his and various others ages not being shown. Did they not know or were these people just enlisted for more “cannon fodder”? I read that many of these men “joined up” simply as a means of getting food. 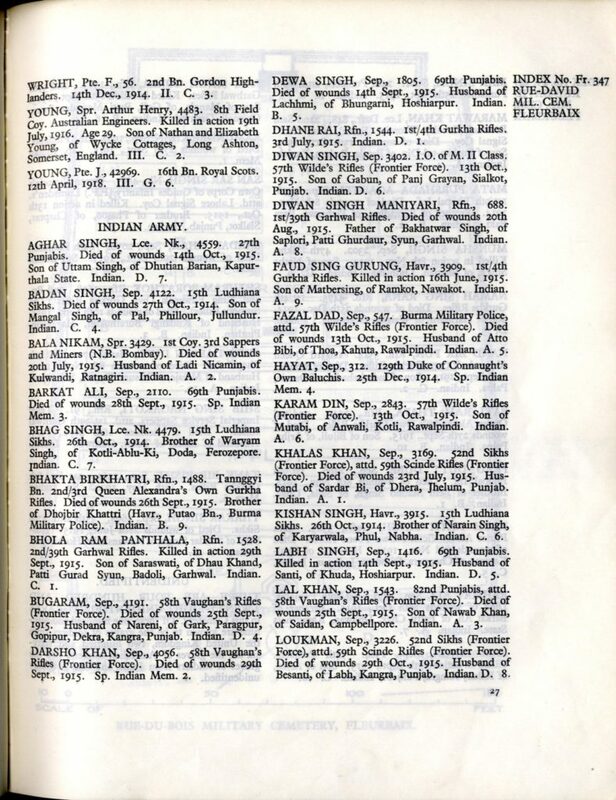 An excerpt: Of all the colonies in the British, French and German empires, the contribution of undivided India (comprising present-day India, Pakistan, Bangladesh, Burma and Sri Lanka) in terms of manpower remains the highest: a total of one and half million men, including soldiers and non-combatants, were recruited into the British Indian army during the First World War. Hey Sid. Good to have you back! Nice article, by the way. I find the whole story of the Indian Army on the Western Front fascinating, and a visit to Neuve Chapelle is a must for a Flanders visit one day – who knows, maybe this year. We shall see. I would juts like to say how much I enjoy these eNewsletters / blog? I produce a eNewsletter in a pdf format for our society Chesterfield and District Family History Society but I like how this is done and would like to use the same for our newsletter and wonder if you let me know the theme / template? I can see it is WordPress. Our website is also WordPress. Thank you Dena. I appreciate your comments. The theme I use is one of Baldrick’s creations, I think. I shall have a word with him if he doesn’t respond to these comments. And absolutely okay to post it here, no problem about that. Dena, I haven’t forgotten your request. I just haven’t spoken to Baldrick since your comment, and he obviously doesn’t bother reading this stuff any more (don’t blame him, frankly. He does quite enough when we are out in the field). But I will mention it to him when I next speak to him. Promise. Appreciated Steven. Honestly, a few words like that are always nice ‘cos there are times (and yes, I have the site stats etc etc) when you do wonder if anyone really bothers with all this rubbish! Lol!